From fast-casual fare to haute cuisine, the menu of dining options at Disneyland Resort offers something for every guest. 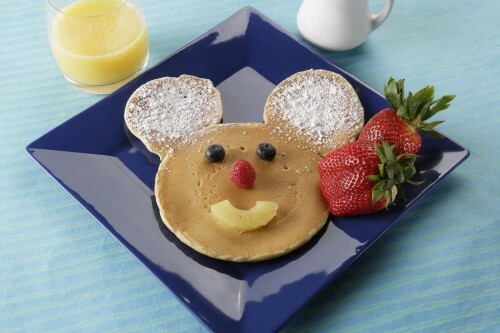 Here, morning pancakes with Minnie Mouse are as celebrated as the spectacular creations at Napa Rose restaurant. The rise in fine dining at Disneyland Resort is often an unexpected delight. At the hotels, top award winners are Napa Rose at Disney’s Grand California Hotel & Spa and Steakhouse 55 at the Disneyland Hotel. A stellar wine program has elevated the quality of dining service throughout the Resort, with trained sommeliers in restaurants including Napa Rose and Storytellers Cafe at Disney’s Grand Californian Hotel & Spa, and Steakhouse 55 at the Disneyland Hotel. Even though vacation may be a time for indulgence, Disneyland chefs provide healthful options, with every table-service and quick-service restaurant offering at least one vegetarian option. For lifestyle dining options, or for requests from guests with food allergies or intolerances, there are a wide range of choices, from kosher to gluten and sugar free. In 2009, Disney tracked nearly a quarter of a million requests for special dietary needs and allergies. “We have a real commitment to innovative, healthy menus,” said Mahmud Dhanani, vice president of Food & Beverage Concept Development. A new culinary dietary specialist recently joined the team to focus on vitality lifestyle ideas. Revised menus require that no more than 35 percent of calories can come from fat – saturated fat and sugar must account for no more than 10 percent of the meal’s calories. And chefs keep tinkering with recipes, such as smoothies, now made with non-fat yogurt and fresh fruit purees (now 120 calories and the former recipe was 420 calories). Kids’ menus, too, are evolving, and changes make healthier choices the standard instead of the “alternate.” Grapes, apples, carrot sticks and unsweetened applesauce in place of French fries and 1 percent milk or bottled water instead of soda, for instance. Guests must request fries and sodas (at no additional cost). Theme park guests looking for food on the run will find beautiful fresh fruit carts in both Disneyland and Disney California Adventure parks. Favorite quick bites in Disneyland include cheddar cheese and broccoli soup and grilled salmon salad from the Harbour Galley in New Orleans Square; sandwiches and sweets from Jolly Holiday Bakery (opening in 2012) on Main Street, U.S.A.; easy-to-eat skewer snacks at Bengal Barbecue and the legendary Dole Whip at the Tiki Juice Bar in Adventureland; Mickey-shaped beignets and funnel cake from the Mint Julep Bar in New Orleans Square; hot pizza from Red Rockett’s Pizza Port and grilled vegetable sandwiches from Tomorrowland Terrace in Tomorrowland. For a relaxing meal, spots such as Carnation Cafe on Main Street, U.S.A., serve generous salads and the legendary loaded baked potato soup. Settle in for barbecued ribs and chicken at Big Thunder Ranch Barbecue in Frontierland (barbecued tofu and veggie skewers available upon request). Enchanting Blue Bayou in New Orleans Square, one of the most-requested reservations, offers diners specialties such as gumbo, jambalaya and filet mignon. Casual, family-friendly eats are on the menu at Plaza Inn on Main Street, U.S.A., and River Belle Terrace in New Orleans Square, where Walt Disney himself enjoyed breakfast on Sundays. For authentic Mexican, Rancho del Zocalo in Frontierland dishes up taco and burrito platters. Out-of-the-way Hungry Bear, nestled in the shady trees in Critter Country, is a favorite for Disney fans who recommend the burgers and the view on the riverfront. At Disney California Adventure, guests can grab a sandwich or sweets at Pacific Wharf Cafe. Cocina Cucamonga Mexican Grill offers tacos with steak, pork, grilled chicken or fish. Hearty Asian creations are served at Lucky Fortune Cookery, with beef, chicken or tofu with vegetables, rice and your choice of four sauces.Other restaurants along Paradise Pier offer retro favorites from corn dogs to cheesy pizza. Corn Dog Castle serves a popular beach snack in two flavors, original and link, with a deep-fried cheddar cheese stick as a delicious meatless option. For guests 21 years of age and older, Bayside Brews offers domestic and specialty beers on tap, along with a selection of non-alcoholic beverages and warm, salted pretzels. To wile away a lunch, dine al fresco at Wine Country Trattoria at the Golden Vine Winery, with a menu of pastas, grilled sandwiches and California wines by the glass. At dinner, the menu adds balsamic-braised short ribs, herb-roasted chicken breast and braised lamb shank. The lively Ariel’s Disney Princess Celebration at Ariel’s Grotto is one of this park’s most-requested reservations, with Ariel, Snow White, Belle, Cinderella and Sleeping Beauty greeting guests at every table. Disneyland: Plaza Inn on Main Street, U.S.A., daily Breakfast in the Park With Minnie and Friends; My Disneyland Birthday Party with Mickey Mouse and Minnie Mouse in the afternoons. At Disney California Adventure: Ariel’s Disney Princess Celebration at Ariel’s Grotto, with Snow White, Belle, Sleeping Beauty and Cinderella at breakfast and lunch. At the hotels: Chip ‘n Dale Critter Breakfast at Storytellers Cafe offers a delicious breakfast buffet, while Goofy and his pals entertain at Goofy’s Kitchen at the Disneyland Hotel for daily brunch and dinner. At Paradise Pier, Mickey Mouse and friends entertain at the Surf’s Up! Breakfast With Mickey and Friends. Priority Seating is recommended in advance by calling Disney Dining, 714-781-DINE (714-781-3463). Diverse flavors, from spicy pasta jambalaya and andouille-crusted mahi mahi at Ralph Brennan’s Jazz Kitchen to Irish salmon and braised Angus short ribs at Catal Restaurant, there are myriad choices for any palate in the Downtown Disney District, conveniently located just outside the theme parks and near the hotels. Hearty dishes (and 175 TV screens, including the ones in the restrooms) give ESPN Zone diners plenty of energy for the restaurant’s interactive Sports Arena. Nearby, House of Blues has diners digging in to baby back ribs and pan-seared voodoo shrimp. For California-inspired cuisine, take a seat at La Brea Bakery and try a grilled panini or homemade soup. For Mexican, it’s Tortilla Jo’s handmade tortillas; for Italian, Naples Ristorante Pizzeria and adjacent Napolini for thin-crust pizzas, pastas, soups and sandwiches. Kids love the tropical storms, waterfalls, aquarium and live parrots at Rainforest Cafe, where guests will enjoy choosing from more than 50 varied items on the menu. About Disneyland Resort: The Disneyland Resort features two spectacular theme parks – Disneyland (the original Disney theme park) and Disney California Adventure park – plus the Downtown Disney District comprised of unique dining, entertainment and shopping experiences. The Resort’s three hotels are the luxurious, 948-room Disney’s Grand Californian Hotel & Spa, the magical 969-room Disneyland Hotel and the 481-room Disney’s Paradise Pier Hotel with its “day-at-the-beach” fun.